Last night I had the opportunity to screen “Me Before You,” a new British rom-com based on the book of the same name. How excited was I? Let me count the ways. First of all, how can any closet nerd not want to see a movie with Daenerys Targaryan, Finnick Odair, Neville Longbottom and Clara Oswald? Bonus: it also features Mr. Bates and Tywin Lannister. It’s a glorious nerd-world amalgamation/love fest! I first saw the trailer with Emilia Clarke and Sam Claflin back in February, and instantly knew I needed to see the movie. But first, I needed to read the book. Even though I read this book specifically to watch the movie, I always get a little nervous about a Hollywood adaptation of a beautiful piece of literature. As is the case with all books-turned-movies, except Tuck Everlasting, the book was better. But, the movie was a fair adaptation. Sam Claflin captured Will Trainer’s morbid humor, while Emilia Clarke perfectly embodied the incandescent joy and quirkiness of Lou. The movie did fail to bring in a few plot points from the book that I thought were integral to both full character development and the comprehensive plot of the second book. So, now I ponder with a slightly pouty lower lip: are they even planning to cinema-fy the second book? They did well to end the movie with closure, but the sequel just provides so much growth for Lou and her journey to self-discovery and fulfillment. The good news is that you don’t need to read the book to understand the movie. 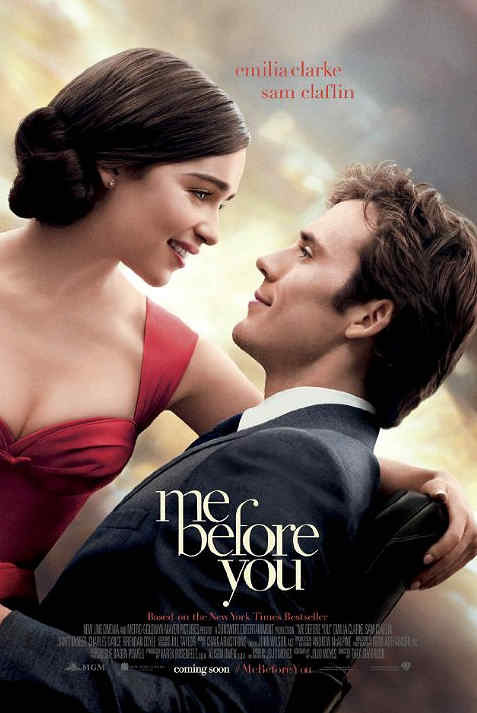 You can see “Me Before You” starting June 3 (and don’t forget your tissues). Be sure to let me know your thoughts on the movie or book in the comments!